In the immediate aftermath of Tuesday’s irritating (not disastrous) defeat at QPR, I wrote in anger about what I thought of Leeds United‘s performance – saying that, although we didn’t get the breaks, we also lacked bottle and class. I’d still stand by that, but possibly with the slight amendment that we seemed to lack bottle and class because we failed to show bottle and class. It’s a small but important difference. In my heart of hearts, I know that this Leeds United squad is not short of courage or quality – they’ve demonstrated on many occasions this season, though not so much lately, that they possess both attributes. The comeback win at Aston Villa, hunting down a lone Wigan attacker like a pack of hungry wolves, late levellers in adverse circumstances as at Middlesbrough. Many such moments. I know all this and I’m proud of it. But I’m sure that no group of professional footballers would expect the fans to take this as read. It’s their job to go out and prove that they have the guts and the skill, game after game, over and over again, all season long. That determination to prove they’ve got the bottle and the class was missing at QPR. And it was right, even in post-defeat anger and hurt, to point that out. I say this, because there are different schools of thought among Leeds fans, both in physical groups, in the pub post-game, perhaps, and online. Some feel they have a right to say what they like, however harsh, having paid their money – even to the extent of dismissing this or that player as “useless” or “should never wear the shirt again”. You see those tweets collected to make articles that purport to be the feelings of the fans as a whole but, in reality, it’s more representative of an extreme group of hypercritical malcontents. Others hold the view that any criticism is A Bad Thing, and that we should all be totally positive as a condition of support, unwilling to hear or tolerate a bad word about anything to do with Leeds. Again, this is quite extreme, though in the opposite way – and it’s probably almost as unhelpful as the rabid critics referred to above. For me, there has to be the possibility of feeding back to the club when you honestly feel that standards are dropping. Some fans are knowledgeable, some are not – and some appear to feel they know better than the pros, be they on the playing staff or responsible for coaching and team selection. But I firmly believe that the vast majority of fans know and love the game well enough, and have enough of a passion for their club, to be able to steer a useful middle path between the extremes, and vociferously support their club, defending them against attacks from outside, while reserving judgement when on-field performance dips. I’m confident enough in my own regard for “my” club that I feel able to launch into them occasionally, without being thought of as negative or hostile. I wouldn’t be writing about Leeds United in the first place if I didn’t feel the highs and lows with as much pleasure and pain even as the players who trot out to the crowd’s applause. Like thousands of others, I was supporting United many years before any of those lads in the yellow shirts at QPR were born. So I wouldn’t like to think that anyone – players, staff, fellow fans or anybody else – would read what I wrote just after the final whistle last night, and think that I’m not a true fan, or that I’m disloyal or habitually negative. I’m not – anyone who knows me will know that I’m virtually defined by my abiding love for Leeds United. It’s always a difficult situation after a disappointing defeat, especially in these circumstances, with the carrot dangling of going back top, and taking on a tired team who’d just reeled off seven straight defeats. But that’s no reason to hold back, so I said what I thought needed saying – and yes, I said it feeling bitterly angry. But that’s not to say I’m not a loyal and committed supporter – I went into print precisely because I am loyal and committed and because, loving the club and believing in the players and management, I have great expectations. For what it’s worth, I believe that the players will be angrier and more disappointed in themselves than even the most gutted fan, and I think they will use that to bounce back at Elland Road on Friday against West Brom. I hope and believe that will happen. But, if it doesn’t, and if we all have another bitter pill to swallow – then please don’t doubt my loyalty and commitment when, choking on that pill, I write another angry and critical piece. Because I really would be doing it for what I honestly see as the very best of reasons – to show that I care deeply. As we all do. The Premier League season, which has been simmering away for the past eight months or so, is now coming nicely to the boil – and it looks set fair to produce quite the most appetising and satisfying feast of the Murdoch era so far. Not for over twenty years have we seen such unlikely and thrilling Title winners as Leicester City would be. Back in 1995, Blackburn narrowly won the crown of Champions, just pipping Manchester United. But they did it by out-spending the big spenders – and it was their third year back in the big time. Leicester are threatening to be top dogs on a budget – and in only their second season at the top table. Many pundits are going back years before Blackburn’s success in an effort to find a precedent for what the Foxes seem likely to achieve in this momentous campaign. As far back as 1978, the Nottingham Forest of Clough and Taylor won the old Division One title in their first season after promotion. Forest took the league by storm, with a thrilling brand of football based on neat passing, hard work, collective responsibility and a pulsating team ethic. The parallels with this Leicester side are easily drawn – but again the timescale was different for Forest, as was the whole vista of English football compared to the moneybags Premier League of today. The closest resemblance to the scenario now panning out for Leicester was the very last Football League Championship campaign in 1991/92, when Leeds United took the title in their second season after promotion, precisely the situation that Claudio Ranieri’s men are now attempting to bring to fruition. Leeds had gained promotion in 1990, and had finished a respectable 4th in their first elite season. Leicester, on the other hand, struggled badly first season up, and were bottom of the Premier League exactly a year ago. But they performed spectacularly to avoid the drop, and they have carried that form over into what appears more and more likely to be their debut season as English Champions. The similarities between Leeds of 1992 and the modern day Leicester are persuasive. Leeds relied on a fast-paced approach, closing down the opposition to win the ball back quickly, creating mayhem with a strong and talented midfield and reaping the rewards of some lethal strikers up front. Most of Leeds’ strength 24 years ago was in their midfield, where Strachan, MacAllister, Batty and Speed were a potent engine room. In Leicester’s case, Vardy up front has been a revelation, and not only for his goals. This is a player who has shone in Leicester’s hard-working team plan, running the channels tirelessly, never giving defenders any peace, always pulling them around and disrupting many a rearguard for the benefit of his team-mates – and to show off his own clinical finishing. Both Leeds and Leicester were unfancied for title success (Leicester were 5000-1 against at the start of this season) – both faced main rivals of historical pedigree who had yet failed to win the top prize for far too long. 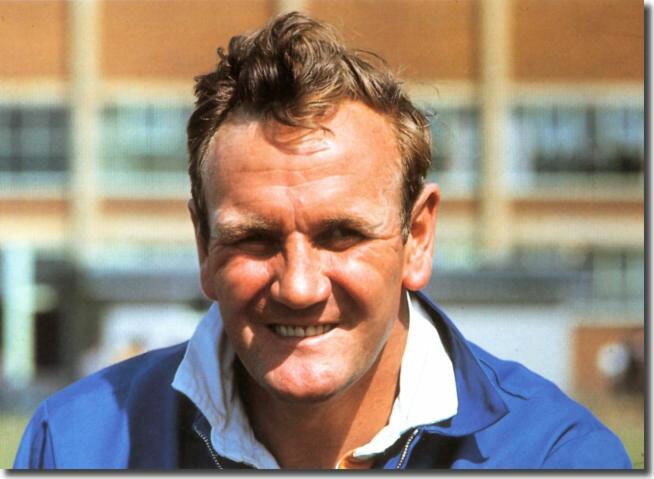 In Leicester’s case, they are looking to deny Spurs, a club with no titles to its name since 1961, the same year Don Revie began his masterful process of creating a Super Leeds machine. Spurs have won a few cups since then, but have never threatened to top the poll. Now, just as they seem better equipped than for decades past to do just that, they could be fated to fail again, as a nerveless Leicester side simply keep on grinding out the results that are inching them towards the ultimate success. 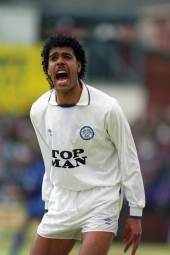 Leeds performed similarly in 1992, appearing destined to lose out to a Man U side looking for their first title in 25 years. But Leeds hung in there, waited for the weaknesses of their rivals to show – and then mercilessly exploited the situation to emerge winners by four clear points. As a Leeds United fan with vivid memories of that last old-style title campaign, I can easily understand the feelings of all connected to Leicester City right now. I remember turning up for games towards the sharp end of that season with nerves stretched taut, utterly unable to enjoy myself until the points were won. And I remember being glued to the radio, waiting and hoping for news of a slip-up for the boys in red. It was exhausting, exhilarating, devastating and miserable by turns; for every upturn on that roller-coaster of a run-in, there was a downturn that had you tearing your hair out. When I watch the Leicester games now, all of them under the microscopic gaze of the Sky cameras, I see the close up shots of fans suffering those same agonies and exulting just as we did when things go well. The animated faces are the faces I remember from almost a quarter of a century ago; the despair is the same, as is the delight. Whether the outcome will be the same remains in the lap of the Gods – or, at least, the Spurs. But I wish Leicester well, as they try to finish off the job I can so well remember my heroes in White doing all those years back. It would be wonderful for the game if Leicester could do it – just as I understandably feel it was brilliant for English football that Leeds United were the last old-style champions. Not many agreed with me back then; we celebrated riotously, but in a vacuum of indifference and resentment. Then again, Leeds never were everybody’s cup of tea. And that’s one major difference with Leicester. The whole country outside of North London is rooting for them to secure the first League title in their 132-year history. “Doing a Leeds” has negative connotations, more to do with a precipitous fall from grace and financial collapse than any sporting success. 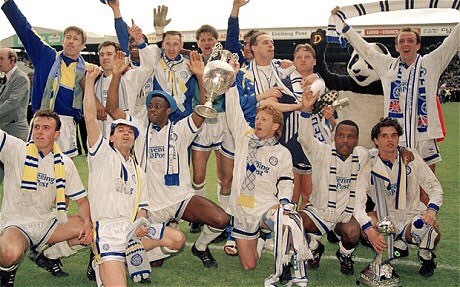 So, if Leicester can close out this season as Champions, perhaps we can rightly say that they’ve “done a Leeds” in a good way – as no club has really managed since those dear, daft days of the early nineties. If anything, Leicester’s achievement would be even greater, a marvellous, unprecedented thumbing of a poor man’s nose at all the sleek moneybags types they’ve left struggling in their wake. All the very best to the Foxes, who could conceivably find themselves a whopping ten points clear with only 5 games to play after this weekend. We’ll look forward to raising a celebratory glass to you, when you can finally call yourselves Champions. 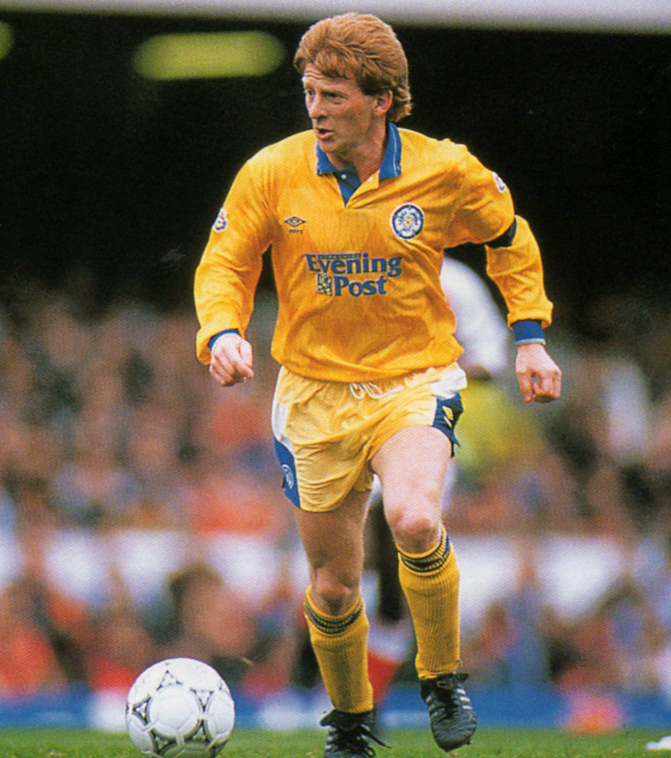 On the occasion of Gordon Strachan’s 59th birthday – and by the way, many happy returns, Sir – I thought I’d look back to what was possibly his defining moment as the man who did more than just about anyone to reinvent Leeds as a post-Revie force in English football. It had been a long time coming since Don’s Glory Boys dispersed to pastures new and a Golden Era faded into the dim haze of memory. We had been eight years in the second division doldrums and had almost forgotten what it was like to be a top team. But – finally! – it looked as though the nightmare was ending as Sergeant Wilko and Captain Strachan were set to lead United back to the Promised Land at long last. A home fixture against Leicester City was the penultimate hurdle to overcome, and expectations were soaring at Elland Road. Twelve days before the Leicester game, United had appeared to strike a decisive blow, battering closest rivals Sheffield United 4-0 at Elland Road. But any hope that promotion could be clinched early was dashed over the next two fixtures, a draw at Brighton where the lead was squandered to sacrifice two points, and then a home defeat to a relegation-threatened Barnsley who even then had the ability to put one over on us with an inferior team. So the nerves were jangling for this home date with the Foxes. Leicester breezed into town with no pressure on them at all as they bobbed about serenely in mid-table, but Leeds just had to win. A victory could possibly clinch promotion; anything else and we would be relying on others to give us that final leg-up – not an attractive prospect. The atmosphere at Elland Road that day was something to behold as 32597 packed the stands and terraces, the Kop a seething mass of bodies, a solid wall of sound. If the weight of support counted for anything, then it seemed Leicester might just as well turn around and go home – but to their eternal credit they fought the good fight and played their part in a memorable afternoon. It all started well. Leeds pressed hard – this had been their preferred approach all season long. No opponent was allowed the luxury of untroubled possession as Leeds snapped at ankles and harried the enemy, hungry for the ball and well able to use it productively. At their best, United had proved a match for any team in the Division; as ever though it was the off days that had let us down. On this particular occasion, attacking the Kop End in the first half, the forward momentum seemed irresistible. Before long, the overlapping Mel Sterland fastened on to a ball at the right corner of the penalty area and fired low and hard into the net to open the scoring. The overwhelming relief was as evident as the unconfined joy around the packed stadium; surely now United would go on to consolidate their advantage and seal the promotion we’d wanted for so long. Frustratingly, it was not to be. Despite further pressure, Leeds failed to make another breakthrough before half-time and Leicester – relaxed and pressure-free – were looking more and more ominously like potential party-poopers. These fears solidified in the second half as the away side pressed an increasingly nervous Leeds back, and eventually – inevitably – they drew level. 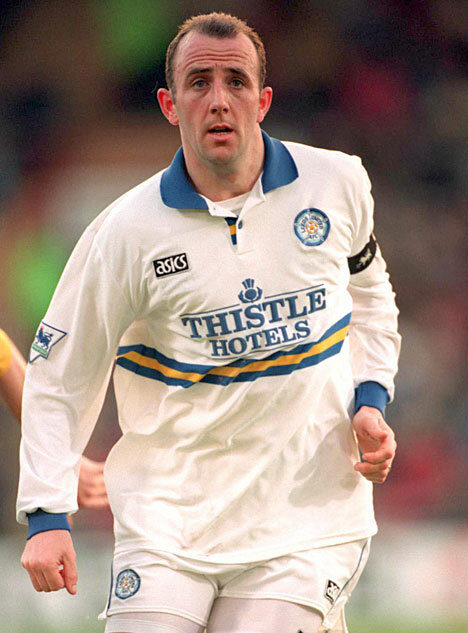 The blow when it came was struck by a rumoured transfer target for Leeds, promising young Scot Gary McAllister. He proved that he packed some punch by belting a fine strike past veteran Mervyn Day to shock the Kop rigid and momentarily silence Elland Road. Worse was so nearly to follow as McAllister almost did it again, another superb shot coming within an ace of giving Leicester the lead, something which would doubtless have produced the unedifying spectacle of grown men crying in their thousands. It may well be that McAllister sealed his move to Leeds with this performance and those two efforts, but I could have seen him far enough from LS11 that day. Leeds were rocking, looking at each other, scratching heads and clenching fists in the time-honoured “come on, let’s bloody sort this out” gesture. Slowly, by sheer force of will, the lads in White regained the initiative and it looked at least as though the danger of further damage was receding. The football was still nerve-shredding stuff, all urgency and little fluency, a desperate battle to eke out the extra two points that would make promotion so much more likely. Time was ebbing away fast now, as Leeds hurled themselves time and again into the defensive barrier of red Leicester away shirts. Panic was setting in, the biggest enemy of constructive football. It was looking like a draw, which would not be enough. 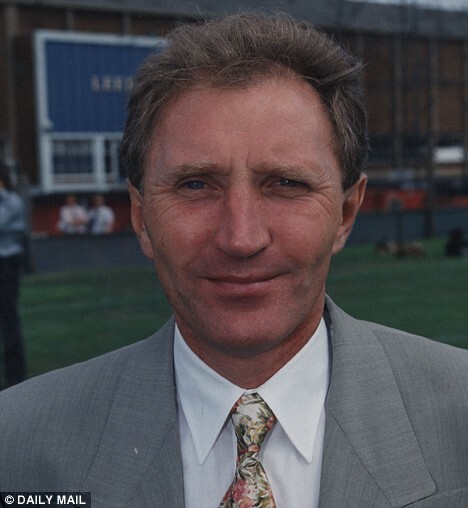 Then, a throw halfway inside the Leicester half in front of the West Stand, under the eyes of a bleakly worried Wilko. Sterland gathered himself and hurled a massively long throw deep into the away penalty area, only for it to be headed out from around the near post. McAllister attempted to complete the clearance with an overhead effort to get rid, but the ball hit Gordon Strachan to bounce back into the box. And there was Gary Speed to lay that ball back instantly to the still-lurking Strachan who simply lashed it, left-footed, into the net. The ball had gone in like a bullet; Strachan – too tired to control it and try to work a yard of space to dink one of those cute little far-post crosses as he might normally – settled instead for catching the ball right on the sweet spot and it arrowed home to a positive explosion of noise from all around Elland Road – the sudden release of what had been unbearable tension produced a massive roar to buffet the ear drums of innocent bystanders miles away. It was one of those occasions when several things seem to happen at once. The crowd behind the goal at the South Stand end seemed to boil with passion and relief, a maelstrom of delighted celebration which was echoed across the whole stadium. Strachan himself ran to the byline, face contorted, weary limbs pumping in triumphant exultation as he took the plaudits of the faithful. A lone copper is visible on the TV footage between Strach and the cavorting hordes, a grin on his face as he moves to quell any ambitious pitch-invaders. In the commentary box, John Helm unwittingly propelled himself into immortality, not for the last time that afternoon. “Have you ever seen a better goal?” he demanded. “And have you ever seen one better timed?” It was a good question, and right then, right there, I doubt you’d have found a Leeds fan to answer “yes” to either part of it. The rest was a blur; Leeds held out, and we had won – and seemingly gained promotion. Rumours were flying around that Newcastle had failed to win, sending us up. But John Helm was at it again, more iconic words: “Is that confirmed…?” When the confirmation arrived, it was of a late Toon win; we still had it all to do at Bournemouth the following week. But Strachan’s late cracker had kept us in a race that we were ultimately destined to win. My final memory of that day is of walking down off the Kop and onto the pitch as the masses there were starting to disperse. We crossed the hallowed turf from goal-line to goal-line, eventually exiting the ground into Elland Road at the south-west corner, where the big screen now stands. I can still remember the heady scent of stud-holed mud and trodden turf, my head was still buzzing as I walked over the spot where wee Gordon had made that perfect half-volley contact to send us all into delirium. 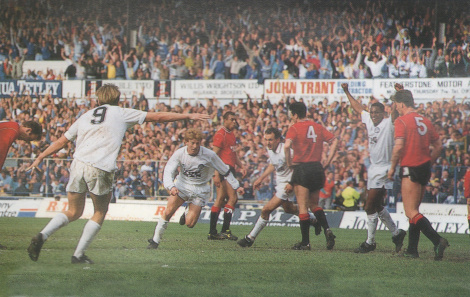 It had been an atmosphere the like of which I have rarely seen before or since, only the mayhem at Bramall Lane when Gayle scored that own-goal title-clincher coming anywhere near, or maybe that ankle-busting semi-riot of a celebration when Dave Batty broke his long goal drought against Man City in 1991. For the sheer relief of it however – the absolute nerve-shredding, tension-breaking release of it – this was definitely THE one. Without Strachan’s sublime strike, we could well have missed out on automatic promotion, and we all know only too well that there’s a law against us succeeding in the play-offs. Gordon’s Golden Goal had kept the dream alive and made possible all that followed up to the League Championship triumph two years later. 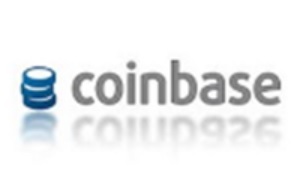 Make no mistake – it was THAT important. Thanks, wee man, for the brilliant memories. Have a brilliant birthday.